I suffer from an ailment that plagues me nearly every day. It isn’t painful, but it does bring on pangs…of hunger. This ailment is food envy, and I feel it most often on weekdays as I browse through other people’s photos on Twitter and Instagram. Photos of tantalizing doughnuts, exotic sandwiches, and food truck delicacies make me wish that I lived or worked closer to the District. The reality is that I am a suburbanite. Sometimes I need to just embrace it. I do this with a visit to Nantucket’s Reef- a restaurant off of Traville Road in Rockville that just may be the antitheses of a DC restaurant. It’s brightly lit, the tables aren’t jammed in next to each other, and there is free parking. While the bright lights make me feel like I’m in a cafeteria, I can’t complain about being able to hear the person across from me. Nantucket’s Reef is meant to conjure up a visit to a New England. It takes some imagination to evoke New England in a shopping center anchored by Giant Food, but once inside it’s not impossible to get swept away by the nautical theme. I am attempting to stay faithful to a weekday Weight Watchers regimen. This is entirely feasible at a seafood restaurant. I can’t help but think about many of my female dining companions who routinely order a serving of fish atop a healthy pile of vegetables for dinner. I am one of you now, at least temporarily. I’m torn between “lobsta” and crab salad. I am at a New England style restaurant, so lobsta (their word not mine) seems like the way to go. On the other hand, I am actually in the state of Maryland. This sways me to order crab. Both salads have the same elements: romaine, avocado, roasted corn, tomatoes, tortilla strips, croutons, and cilantro vinaigrette. I hate hearing myself say hold the croutons, and dressing on the side. But I have goals to meet, and weekend indulgences lie ahead. Nantucket’s Reef crab salad satisfies my desire for a healthy and and relatively low cal dish. It’s not the least bit creative, but I appreciate the generous serving of fresh crab, and the tortilla strips sate my desire for crunch. It’s just salad, which makes it hard to make much of a judgement about the food, but it is respectable if not covet-able. 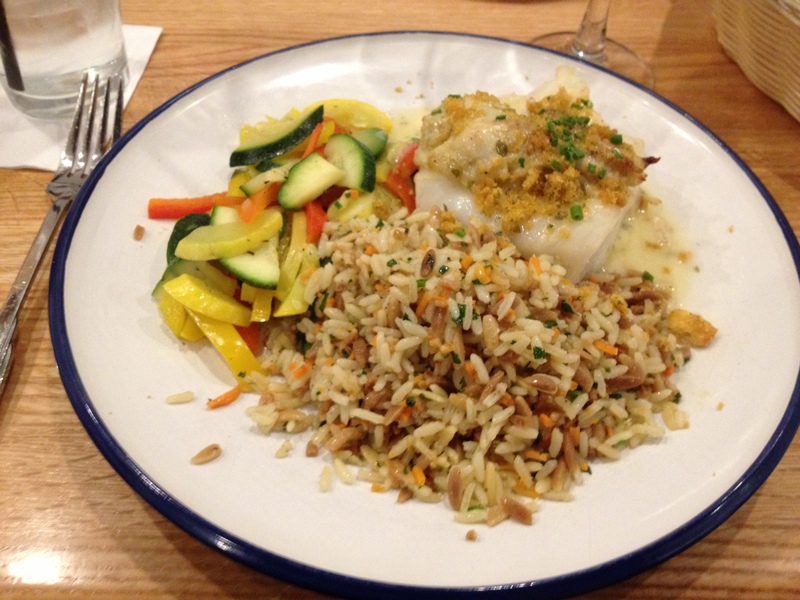 Would I prefer my friend’s New England stuffed cod with jumbo lump crab, seasoned cracker crumbs, and lemon butter sauce? Why yes, yes I would. Although, I wonder how an ordinary blend of zucchini, squash, and carrots can be called Nantucket veggies. I get that it’s just a weak attempt to incorporate the theme. My friend is delighted that the fish is served piping hot. Accompanying corn meal muffins are a plus. And while she would appreciate more crab and less butter, she is satisfied enough to consider a return visit.